You are here: Home / DIY / Gardening / Is “Good Enough” Good Enough in DIY? I woke early this morning, about 3:47, moments before my 4 a.m. alarm sounded, which is unusual. 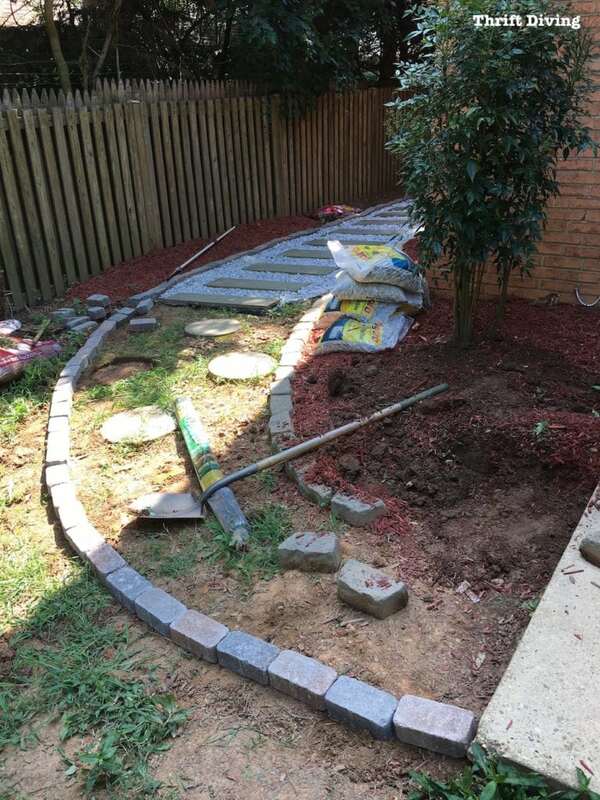 But thanks to GERD, which sometimes can be a natural alarm clock (total sarcasm intended, LOL), I was up and alert and decided to spend a couple of hours this morning researching: How to Properly Lay Pavers. 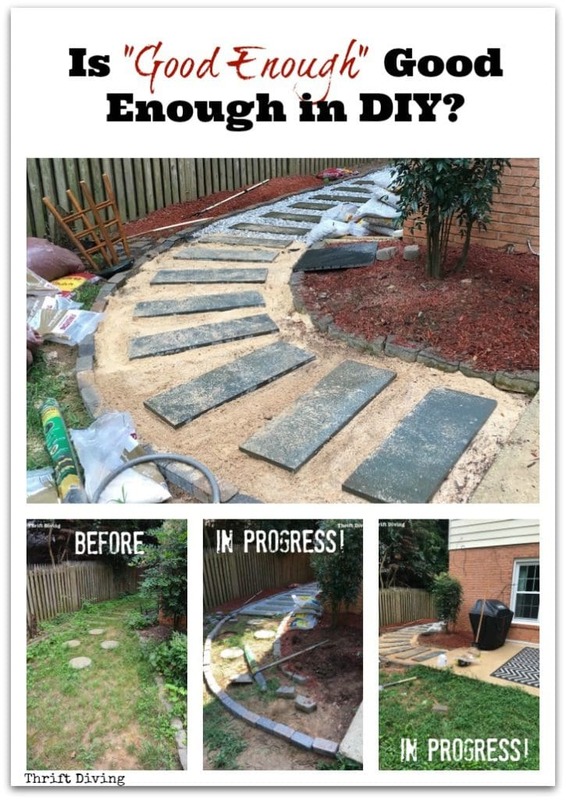 As you read in my previous post, I’m creating a walkway around the side of my house, leading to my patio, which has been the focus of my Patio Makeover Challenge this month. I excitedly worked on it yesterday until we were hit with thunderstorms, at which time I disappointedly put everything away. But I was glad for the break because I’ve reached a point in the walkway where I’m not quite sure how to proceed correctly. So I’ve spent the morning scanning YouTube, looking for confirmation that I’m doing this right. 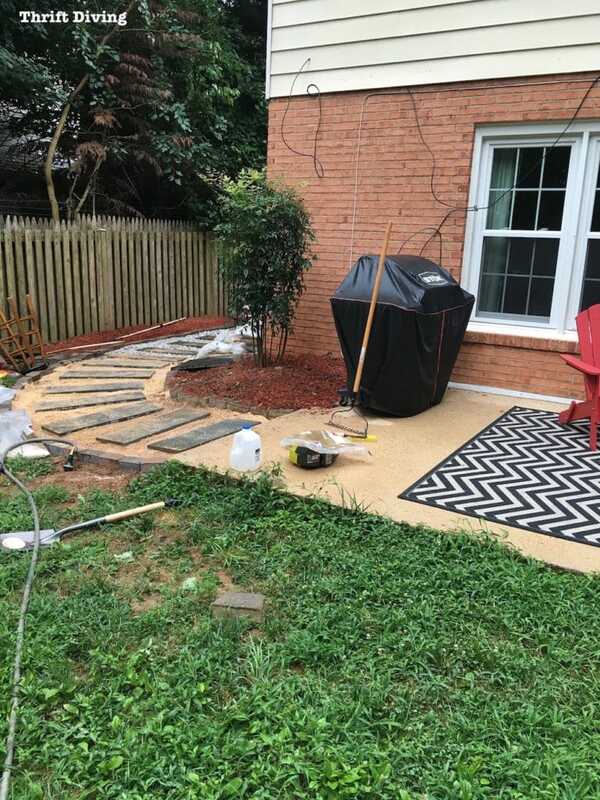 I’ve Googled, hoping that my walkway isn’t going to fall apart months after installing it. I’ve Pinterested, crossing my fingers that I’m not creating an ugly design that nobody would want to pin. Is “Good Enough” Good Enough in DC? The following questions are what many DIY’ers ask when they tackle a project, especially one that they’ve never done before. And it’s what I spent the morning asking myself as I prep my walking path for the final installation of the pavers and 36-inch stones. What if there are gaps? What if I have wasted money? We could fill in that last blank space with any doubt or question was want, just as I have been doing this morning while doing my research. What if “good enough” is good enough? Is this safe for me and my family? Does it look acceptable considering I’ve never done this before (or have done it very few times)? As long as we’re not going to stub our toes or trip and break a knee, it’s safe. And yes, I’m totally loving how it’s coming along so far, even if my bricks aren’t 100% straight. 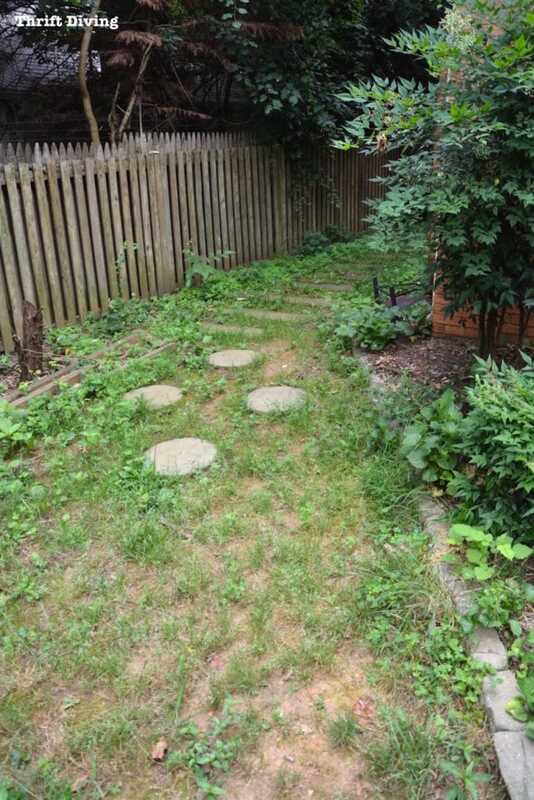 Compared to the weed-infested jungle of the “BEFORE” picture, this is definitely an improvement!! (Just got to get rid of those pesky wires hanging down!). Well, I’ve learned that this is back-breaking work. 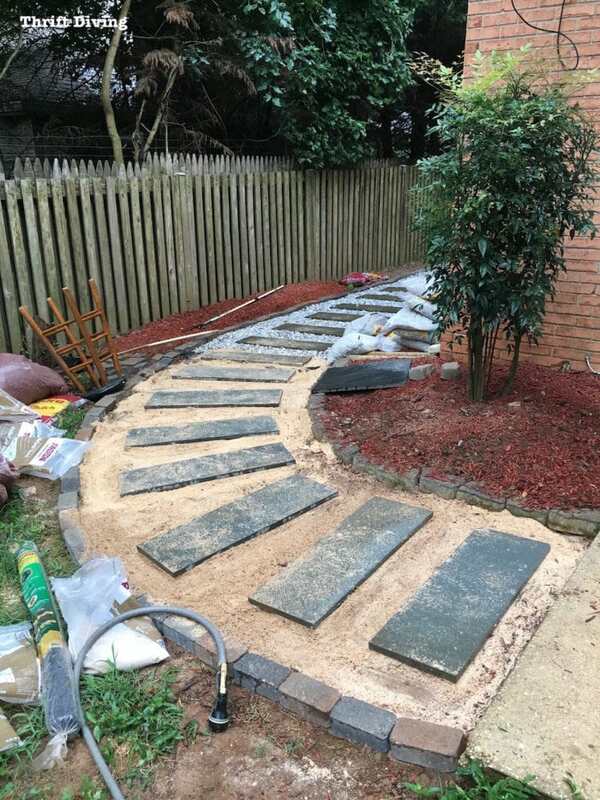 I’ve learned that it’s expensive and often requires a lot of materials (this path has already used up about 26 bags of 40-pound rocks!!!) so it’s best to have these items delivered in bulk. I’ve learned about using different gardening tools I had never used before. I have learned that when you take care of the outside of your home, your pride of homeownership increases. I have learned that you can simply dig up and replant trees and shrubs, instead of feeling like you have to work your design around them. So….what I’ve learned has been valuable, even if the project hasn’t been perfect. Even if in the next year, if it crumbles and I have to start over, I will have learned something! Instead of moving forward with doubt and worry, I feel pretty good that I can say, so far, this project is good enough for my family and me. Have you ever worried about a project, and then realized, it’s good enough? Leave a comment below and let’s talk about it! Boy, I know where you are coming from!! Right now I have a mirror leaning against my wall that I am trying to decide if it’s good enough. The only standard you can go by is- Do I like it? Right now, I’m going to say no, so I guess it’s not good enough just yet!! I would say you absolutely did good enough. Excellent job. Having done many DIY projects sometimes you just gotta jump in and do it. Keep it up. Retirizing interdicted me to you. I am glad to find your blog. Sometimes good is good enough especially when you like it. Ive had many projects that crumble tat I loved. It was the work and creativity and enjoyment that went into it that made it worthwhile. Cant wait to see the finished project as I did witness the labor that you put in. 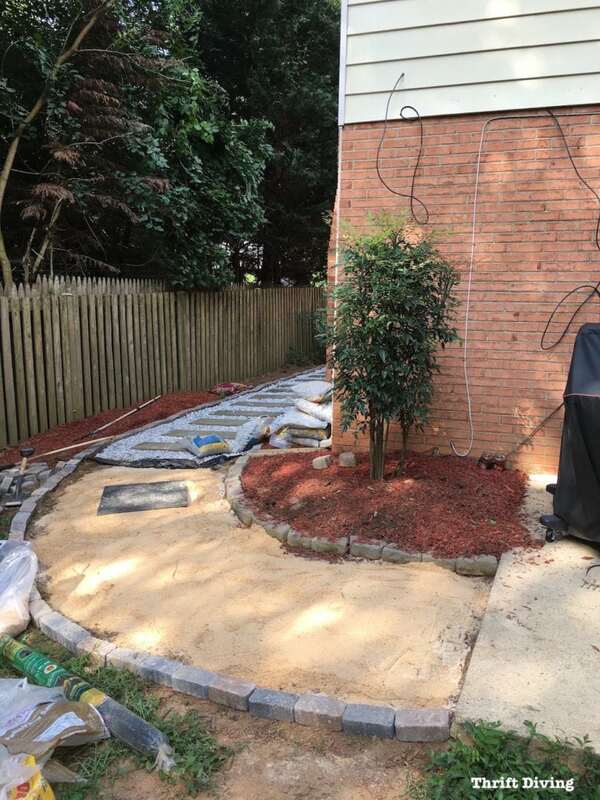 Next time if you can…estimate the final cost and labor. But dont’ let that stop you…just let it guide you.